Marguerite Hanna (Ganymede), Michelle Morris (Celia) and Teo Saefkow (Touchstone) in the Studio 58 production of As You Like It. Photo by David Cooper. The Studio 58 production of As You Like It contains some fascinating staging. And while it begins and ends beautifully, it does get somewhat muddled in the middle. Studio 58 is the professional theatre-training program at Langara College, considered one of the best in the country. The productions they produce feature fourth, fifth and sixth term students who do everything from contemporary dramas, to musicals, to Shakespeare. The students also get to work with professional directors and designers, while being coached by their teachers. 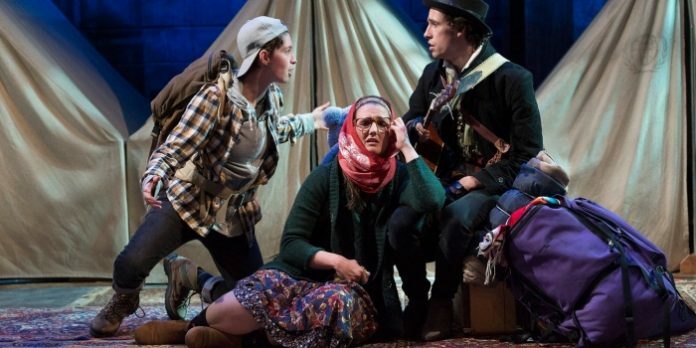 Director Michael Scholar Jr. sets this production of Shakespeare’s As You Like It in a modern-day refugee camp, tolerant of cross-dressing and gender-queer citizens. Presented as a story within a story, the actors remain on stage watching the action, and are seen getting ready to enter the play. The story cribs some of the devices from other of Shakespeare plays: exiled people cross-dressing, mistaken love, and saucy fools. Orlando argues with his brother, who then sets him up in a wrestling match where he is to be killed. He survives and catches the eye of Rosalind. She is the daughter of the recently usurped duke and banished to the woods of Arden. She goes with her friend Celia and some other nobles, disguising herself as a boy named Ganymede. When Orlando comes to the woods Rosalind decides to test his sincerity by engaging in a role-play to supposedly shake him of his infatuation. He will call her/him Rosalind and she will rebuff him. Unfortunately, a randy shepherdess falls in love with Ganymede, and faster than you can say “Three’s Company”, wacky misunderstandings abound. 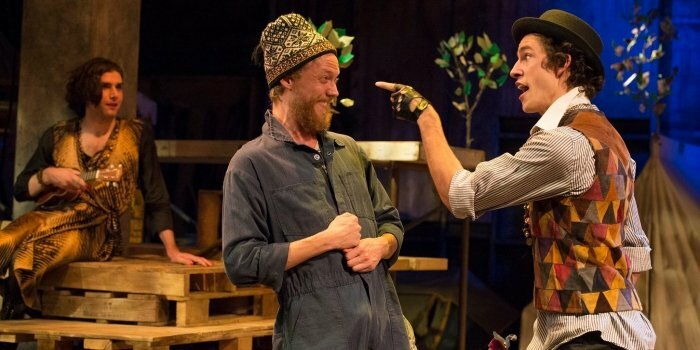 David Johnston, Evan Rein and Teo Saefkow in the Studio 58 production of As You Like It. Photo by David Cooper. One of the challenges with presenting Shakespeare’s comedies is finding the humour. What was titillating and intoxicating 400 years does not necessarily translate to a 21st century audience. Although, to be fair, As You Like It is not considered one of the Bard’s funniest comedies. Also, with no disrespect to any of the student actors in this show, there are some people who are truly funny, who can make you laugh out loud. There are others who are just brilliantly fun, and while they have energy and sparkle, they only provoke a smile. The script and situations are light and a bit contrived. Since most of the actors are directed to be energetic and earnest there is no invention as they deliver the lines. The result is a show that gets bogged down in the middle as new characters and situations unfold. But there is nothing funny happening or being said, and the laughs-per-minute get further and further apart. That said, the opening is spectacular, the layered singing is sublime, and staging is breathtaking. The end moment where four couples get married is captivating, full of raw and heartfelt emotion. Also, when some of the actors pretended to be sheep it was quite lively and fun. Some of the actors here really distinguish themselves. Michelle Morris as the friend Celia is fresh, making strong choices in a small role. William Edward is moving as Orlando; when he hears from Ganymede that Rosalind was so to arrive, he listened intently and was affected but what he heard. The crossdressing character Amiens, played by David Johnston, has a lovely singing voice and cuts a handsome figure, but it gets repetitive in act two. Marguerite Hanna as Rosalind/Ganymede has a lot of heavy lifting, with endless dialogue and so many of the characters circling around her/him. She has some lovely moments, particularly when being tender, or when being comically exasperated. She did have a tendency though to shout some of the more expository speeches. This production of As You Like It looks great, is a wonderful opportunity for the student actors, and the opening and closing are enticing. However, when it gets into the middle of its two hour and forty-minute run time, the earnestness and emphasis on style makes it challenging to stay involved. As You Like It by William Shakespeare. Directed by Michael Scholar Jr. A Studio 58 production. On stage at Studio 58 at Langara College (100 West 49th Ave, Vancouver) until October 15. Visit http://studio58.ca for tickets and information.